The area farmers often raised multiple products for their own use and for sale. Many of these breed are now very rare and there is an effort to preserve them. 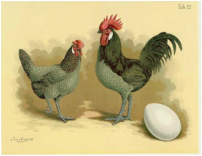 There is a new interest in these heirloom breeds and many people are now raising chickens in backyard facilities. The list is sorted by breed, township, and last name. To find a name, do a page search either with the "bar" icon at the top right of the page or use CTH + F.